Welcome back to the alphabet fun! Love your photo, Jan, and how beautiful they are! Hope your week is going well! San Diego Zoo is the zoo I most want to visit, although it will be a while before I can afford that. They have such pretty colouring - looks like they are wearing a scarf! I just recently started again after a lengthy hiatus. They must look wonderful as a herd on the grasslands. Welcome back to our merry band of ABC'ers. Love the shadings of these beautiful creatures. Oh, they are so lovely and graceful! I'll have to see what I have for "A". 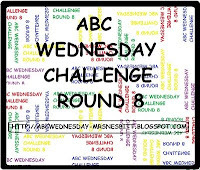 Welcome back to ABC Wednesday! This is a lovely photo and beautiful animal. They are so cute and pretty ! Welcome back to ABC ! Thay have such sweet faces, at least in the side view. They are so graceful and lovely! Nice capture, Jan!